this course will not commence as planned but has been postponed to September 2019. Registrations are open for the September date now. Organised by the ACRN Oxford Centre Ltd. In this course you will learn how to use Python with the most salient libraries to gain data driven insights into typical research problems from various disciplines. This course is not a complete beginners’ course, yet it allows you to enter with just some fairly basic statistics knowledge. This course is also not meant to comprehensively cover programming and algorithms, yet we will introduce you to some important concepts and show how these can be applied for novel approaches to your data. Please find the link to Application here. 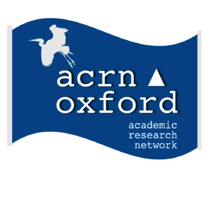 Join us for three inspiring days and become a life-long fellow of the ACRN Oxford Research Network!